As previously mentioned, the Archaeological Investigations Project (AIP), based at the University of Bournemouth, has been gathering brief details of developer-funded archaeology that has taken place in England since 1990. They provide an excellent, useful resource for archaeological researchers, but unfortunately we understand that their funding has now come to an end, at least until early 2013. We were particularly sad to hear that Ehren Milner was losing his job, as he has been very helpful to us in our work on the EngLaId project. We wish Ehren all the best for the future and hope that the AIP is able to continue their excellent work at some point soon. One of the most important datasets with which we are working on this project is the English Heritage (EH) administered National Mapping Programme (NMP), which has been working all across England to map archaeological features seen in aerial photographs. This project has been ongoing for about 20 years and, as a result, the methodologies used by those undertaking the work has evolved over time. More recent NMP projects were undertaken in CAD software, with the result that the drawings produced exist as vector data, which is very flexible for GIS mapping purposes. 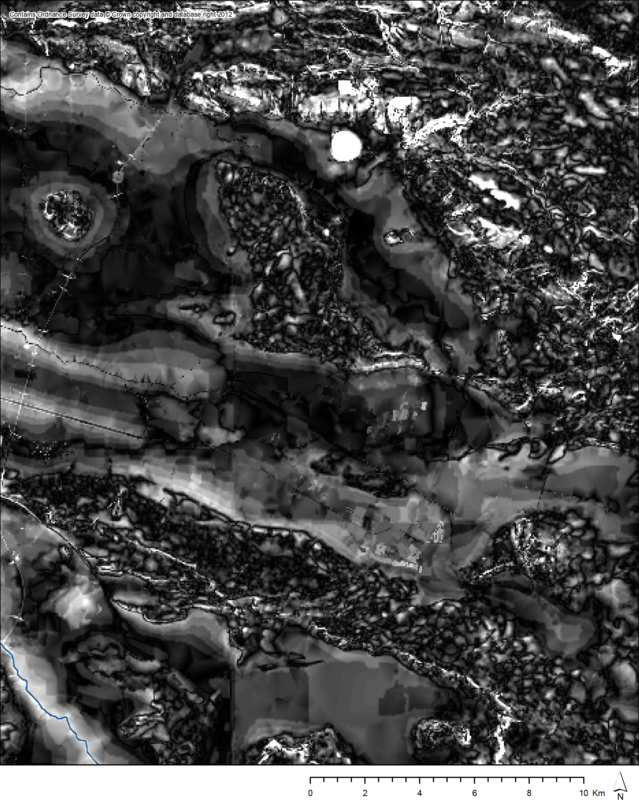 However, I have been thinking over the last few days about how to deal with the older areas of the NMP that exist as scanned raster images of line drawings. 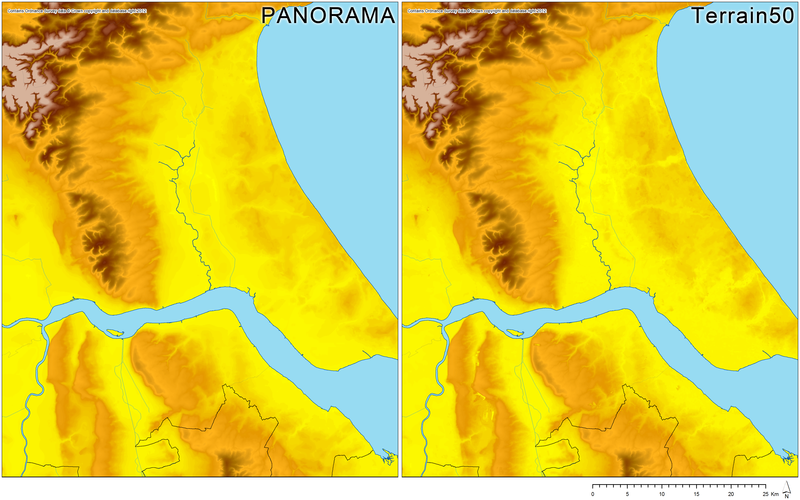 This raster NMP data is less flexible, in that raster imagery does not scale well when looking at broader regional patterns (when compared to vector data) and it is difficult to display any background data behind raster tiles (making the white areas invisible tends to make the black lines fade, as obviously does making the layer partly transparent). I have also been talking recently via email with Helen Wickstead about some of her ideas for examining the topological relations in field system layouts and this type of analysis would be impossible with raster scanned maps. 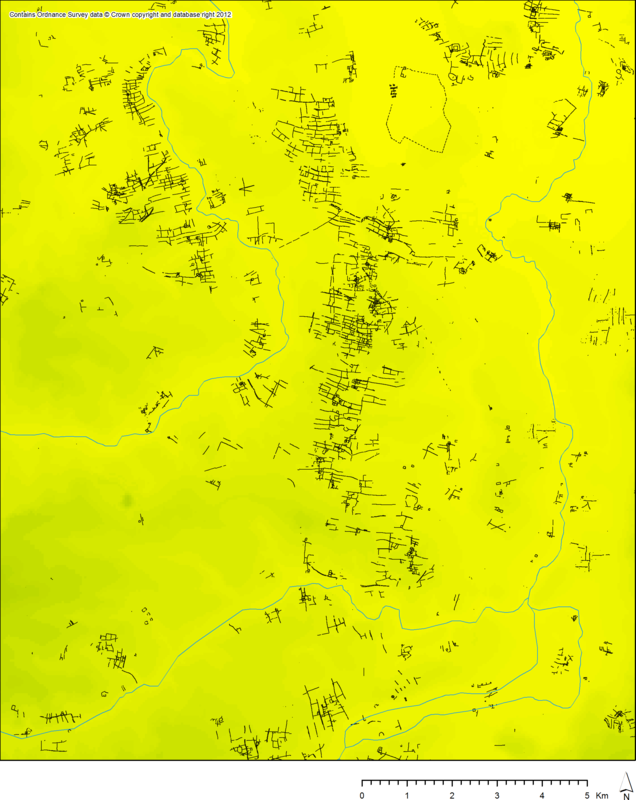 As a result, I decided to try to convert the raster NMP tiles received from EH to date into vector data. I came up with quite a simple system to do so, after a bit of trial and error. 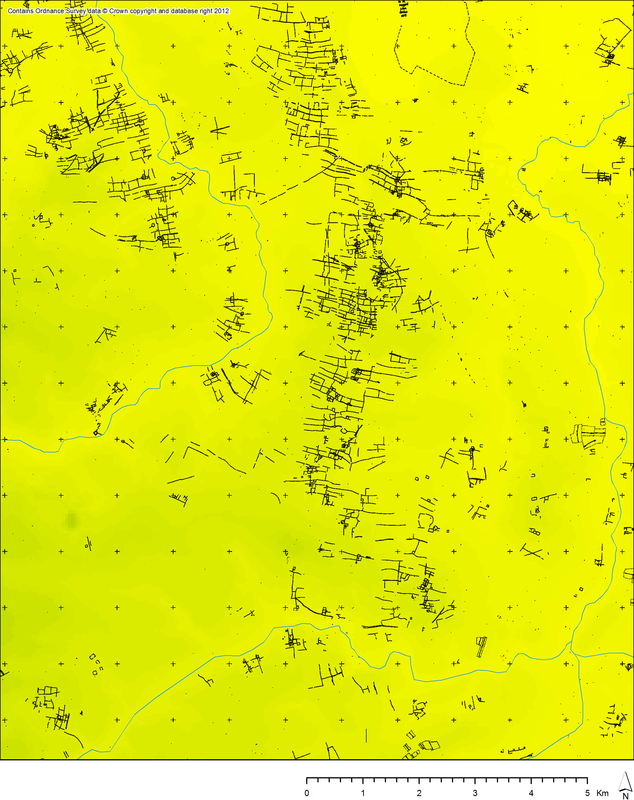 First, we reclassify the data in the raster tile so that the white areas have a value of ‘NoData’ and the black areas (i.e. 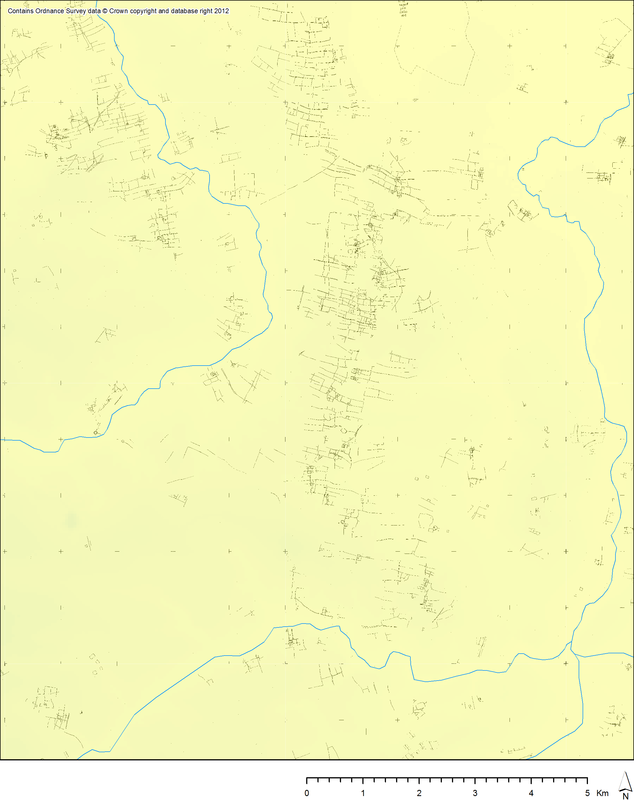 the drawings) retain a value of 1 (for most tiles, the black areas already have a value of 1 and the white of 0, but this is reversed for most of Kent and some tiles in Lincolnshire). The next stage is then to use the Raster to Polygons tool to convert this result into a polygonal vector layer. Ideally we would want to convert them to lines rather than polygons, but they are too ‘thick’ for this to work (more on which later). The result includes a large amount of small polygons which add little to the overall picture other than making the layer render on screen slowly. If we assume that these original drawings, which were done at a scale of 1:10,000, were undertaken with a minimum pen width of 0.1mm, then any polygon smaller than 3.14m² would be smaller than the head of a pen and, as such, unlikely to be deliberately plotted. Therefore, we then calculate the area of the polygons in the layer, select those with an area of greater than 3m² and export that as our final result. 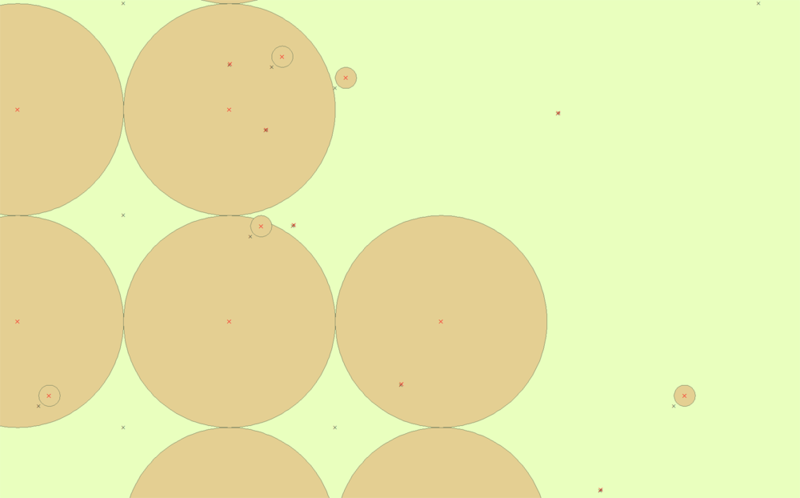 For the datasets processed to date, these small polygons amounted to about 20% of the total, which have been removed to no obvious visual effect. 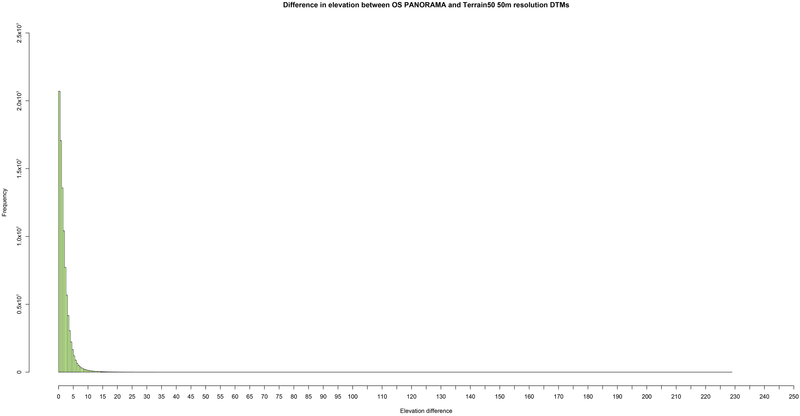 I am reasonably satisfied with this result, but there are a few things I would still like to do to tidy up the layer. That is to remove the grid marks (or grid lines in the case of some NMP projects, e.g. 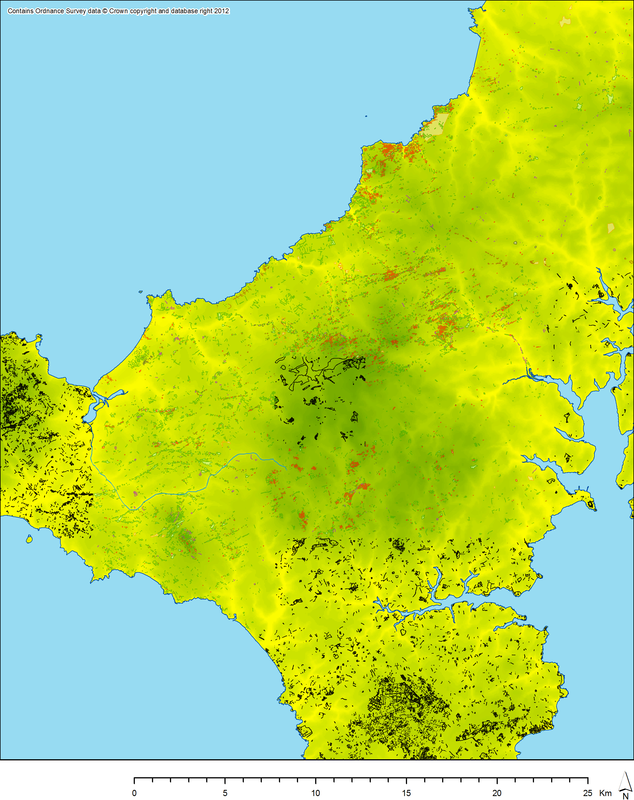 Dartmoor and most of Kent) and, ideally, to remove the pieces of text on some of the images (particularly Dartmoor). I cannot (yet) think of an automated way to deal with the latter, but removing the grid marks / lines can be automated, albeit with a somewhat imperfect result. The result is clearly imperfect, but does look cleaner than the original result. For some areas, bits of grid mark or line still appear within the resulting layer, where they slipped outside the mask, but these can be cleaned up manually where necessary. 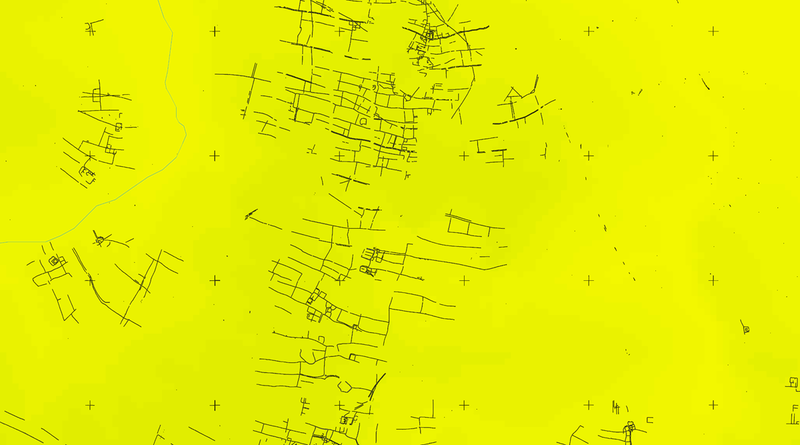 The main problem with this automated approach is that it can cut out small areas of the drawings that relate to archaeological data where they overlap grid marks / lines, but these should be fairly minimal, and largely invisible at broader scales of rendering. We can see that the vector NMP areas have more attribute data attached to them, so that we can plot this data in different colours according to the morphology of the feature (i.e. bank, ditch, etc. 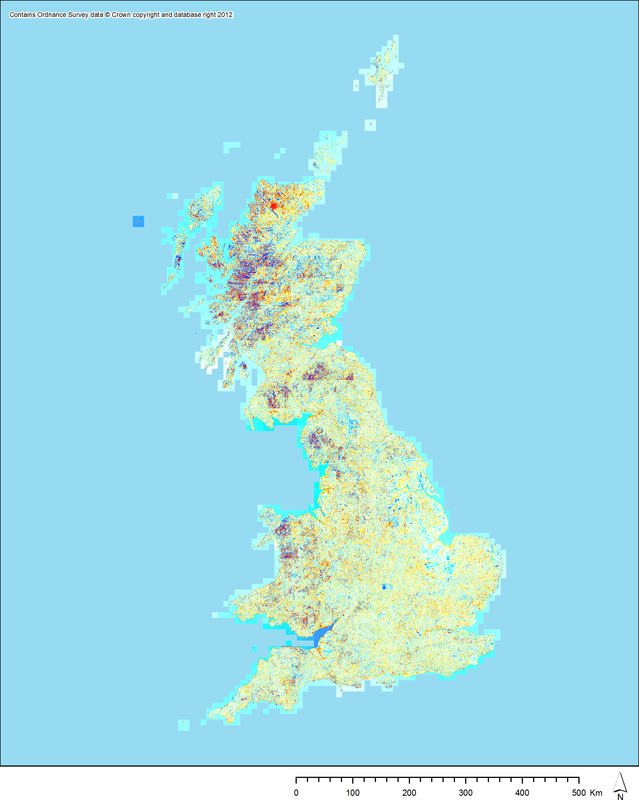 ), but the vectorised raster NMP areas are now easier to plot alongside the vector areas, especially on these type of broader landscape scales. I am quite pleased with this result, and it certainly helps greatly with the plotting of the areas of the NMP which exist as raster data, but it does not help greatly with the previously suggested idea of examining the topological relationships within field systems. 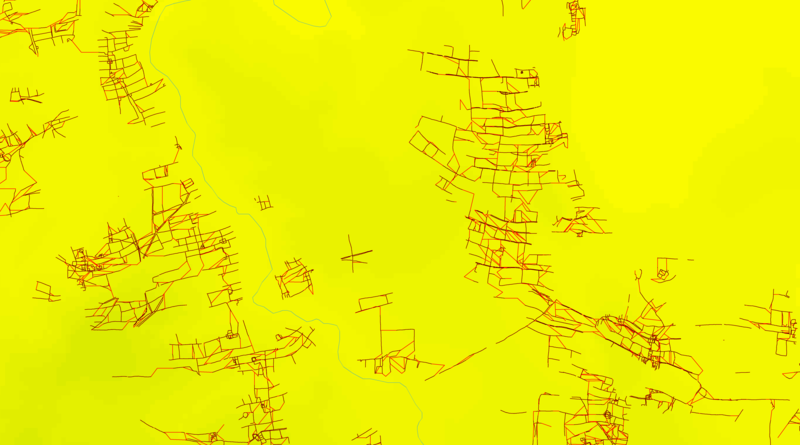 I think that there may be a way to produce a line (rather than polygon) result by processing the original data using the Thin algorithm in GRASS GIS, but this would need care and is probably only feasible for quite restricted areas. I shall return to this idea at a later date! Often when dealing with spatial data recorded using Ordnance Survey (OS) National Grid References (NGRs for short), you will find that different objects within your data are recorded to differing levels of spatial precision. This can lead to misrepresentative results if treated simply as point objects (especially for objects poessessing only a very vague location) and, therefore, we need a method of representation that is truer to the actual spatial precision of the data objects. To help explain, NGRs are formatted as follows (fee free to skip this paragraph if you understand NGRs): the OS divides the UK up into 100km by 100km grid squares, which are designated using two letters. Therefore, an NGR consists of two letters followed by a string of numbers, the numbers representing the object’s location within the large grid square. There should be an even number of these digits, with the first half representing the easting and the second half the northing. However, the exact number of digits will vary according to how precisely located the object is. For example, an NGR such as SQ2222233333 is in the square SQ at the location 22222 metres east, 33333 metres north; however we would have to add zeroes to a shorter NGR as the precision of the point is less well known, e.g. SP444555 is in the square SP at the location 44400, 55500. 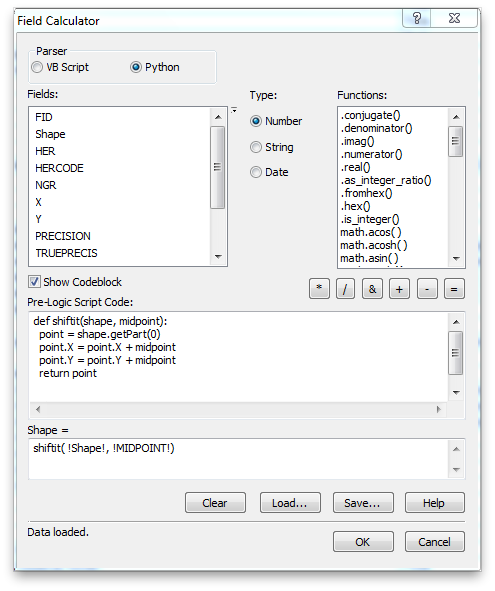 For more on converting NGRs to numeric coordinates, see my previous post. However, simply counting the digits is not always a sufficient measure of coordinate precision, as the person who entered the data may have tagged zeroes onto the end of the easting and northing. For example, the NGR ST5500066000 appears to be accurate to the nearest metre, but it is unlikely that a point would fall exactly onto the 55000, 66000 point and, as such, it is much more likely that this point is recorded to the nearest kilometre. I have a small Python script to perform this test, which can be downloaded here. 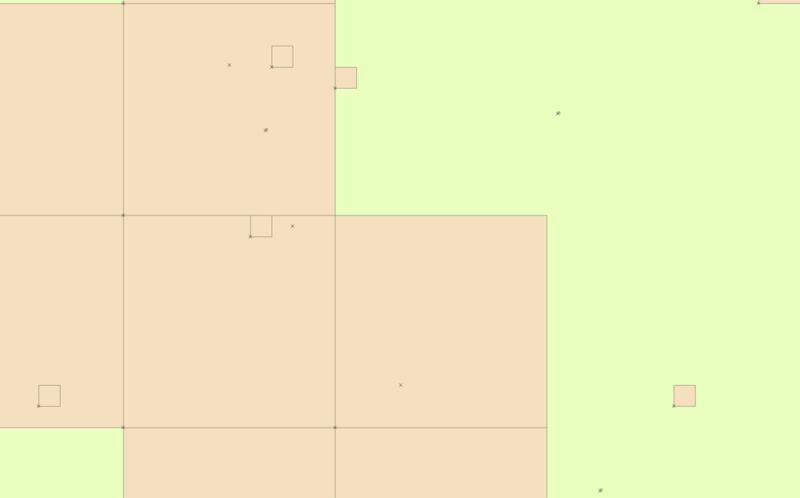 In any event, the end result of this is that an NGR that is apparently a point is, in fact, properly the origin point (southwest corner) of a square of width and height equal to its precision, e.g. the NGR ST5566 represents a square 1km by 1km spreading northeast from its location, whereas the NGR SQ2222233333 is a 1m by 1m square. Therefore, if we want to represent these points properly in a GIS environment, we have to present them as squares of appropriate size. 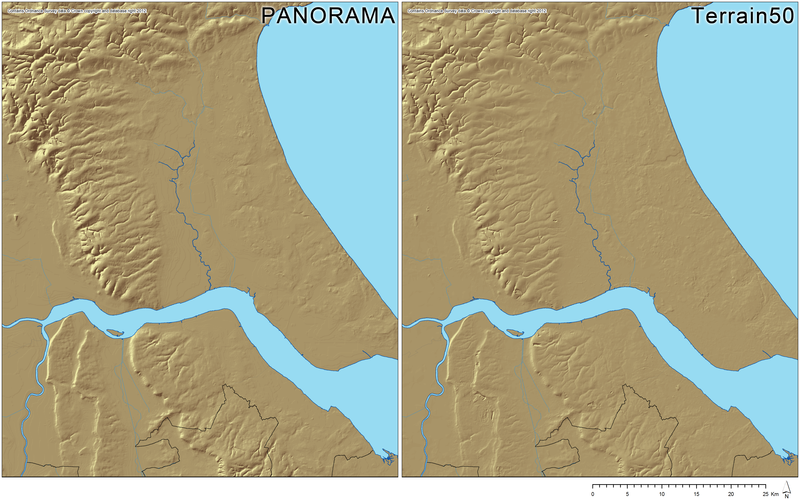 So how can we automate creating this representation in ArcMap (version 10)? * I will assume reasonable familiarity with the software. Calculating the midpoint of our square. 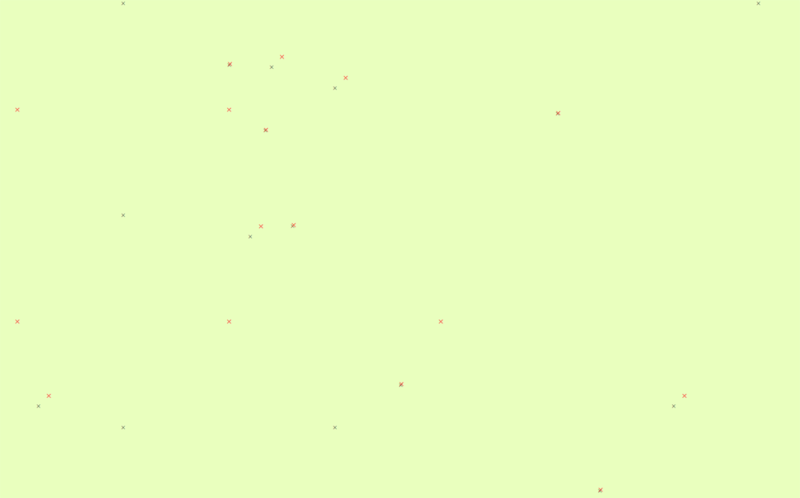 New point locations plotted in red against old in black. The final result of the process. Any points that do not seem to have output squares in the image do, in fact, have them but they are too small to see at this scale (e.g. 1m or 10m precision). 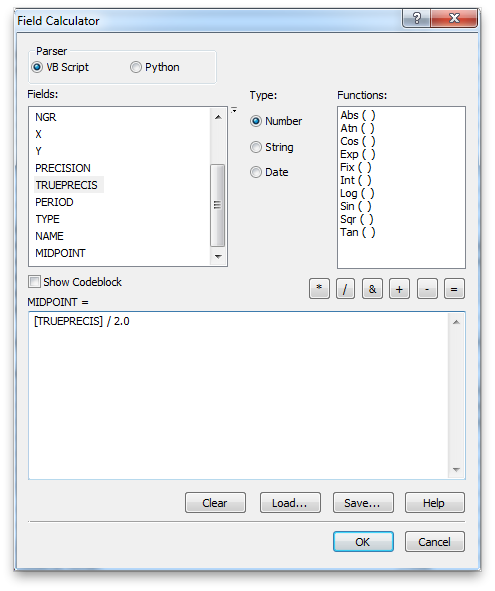 Overall, this is a simple way to do this task in just a few minutes whilst avoiding any overly complex scripting. I think I will work on a Python script to achieve this task in one step, but the method just described works perfectly well in the interim. The final result means that we now both have a visual representation of the area to which each of our NGR “points” actually relates, and also a layer which can be used in further analyses when trying to understand the contents of our layer: all of the layer attributes from the original layer should find their way automatically into the final output, so we can perform whatever analyses we wish on our new, more properly representative geographic objects. * ArcMap is part of ESRI’s ArcGIS and is the GIS software that we are predominantly using in this project. ** If you did not record the precision of the NGRs whilst converting them, you could use the Field Calculator to work it out (in the same way as described above for the other calculations). You would have to create a fields called something like ‘PRECISION’ and ‘TRUEPRECIS’, and then use the expression code downloadable here and here in turn on the first and then second fields.